I love leftovers because you can eat in basically the amount of time it takes to heat them up. To me, that’s magic! But, as much as I love eating leftovers as is, I am absolutely fanatical about making leftovers into new dishes, like these Thanksgiving croquettes. What’s not to love about deep fried potato-y things? 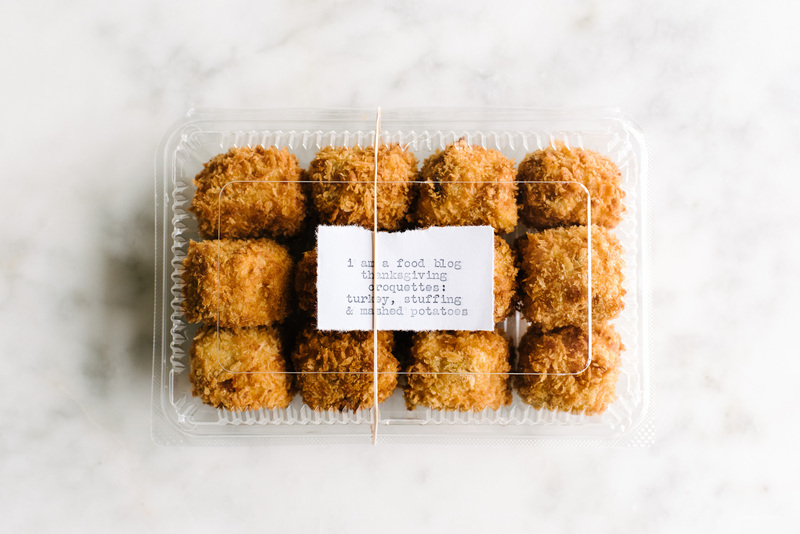 Croquettes are French, from the verb croquer, which is to crunch. Interesting right?! I don’t know random food knowledge by the way, I just like googling things. 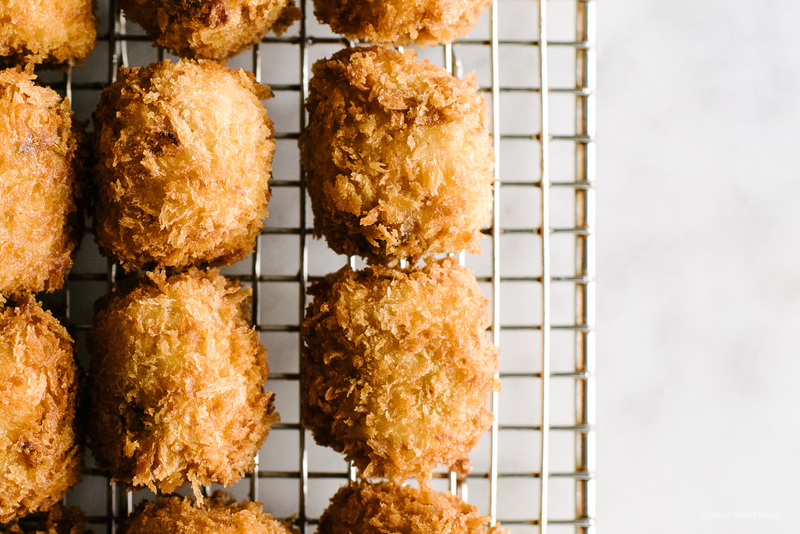 Anyway, croquettes might have started out French but I’m pretty sure that every culture has a version of croquettes because deep fried foods are popular the world over. Japan is no exception. Croquettes are called korokke here and they are ubiquitous as fried chicken in supermarkets/convenience stores. There are even dedicated korokke stores. I absolutely love Japanese korokke, with their creamy mashed potato insides and crispy crunchy panko-ed outsides. I took a page from the korokke book and made Thanksgiving croquettes: leftover mashed potatoes, turkey, and stuffing. A quick toss into flour, egg, and panko and a hot oil bath later and these guys were definitely bestovers. 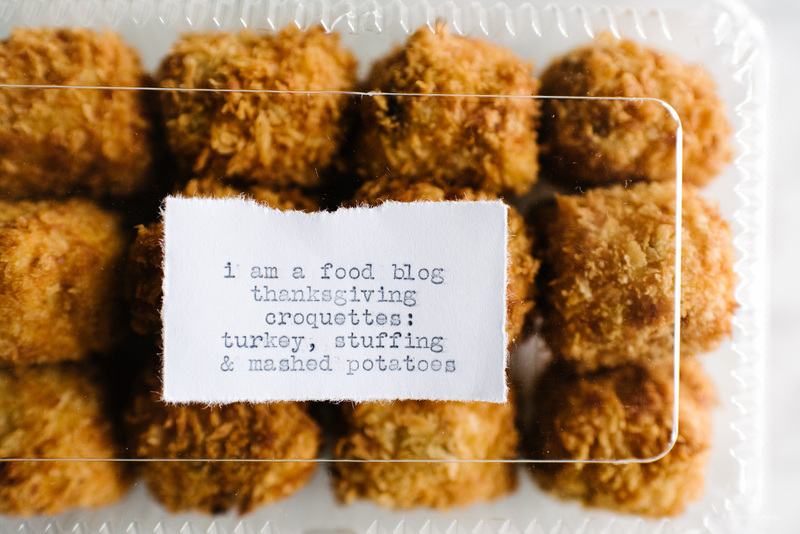 Everything I love about turkey dinner turned into a convenient hand held tater tot shaped deep-fried bite. I loved them with a bit of cranberry sauce, but they were also excellent with tonkatsu sauce. Seriously good! In a bowl, add the stuffing, mashed potatoes, turkey and egg. Season with salt and freshly ground pepper and mix well. I like to use a cookie scoop to portion out the mixture. Scoop out about 1.5 tablespoons and shape, compacting into a tater-tot shape, until all of the mix is portioned out. Set up a breading station with three shallow dishes. One with flour, one with a lightly beaten egg, and one with panko. 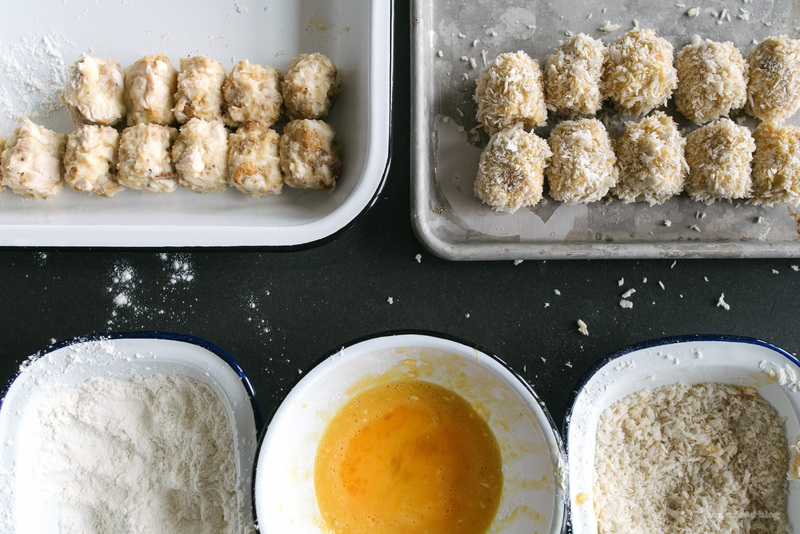 Working gently, with one egg at a time, dip the croquettes into flour, shaking off excess, then coat in egg wash. 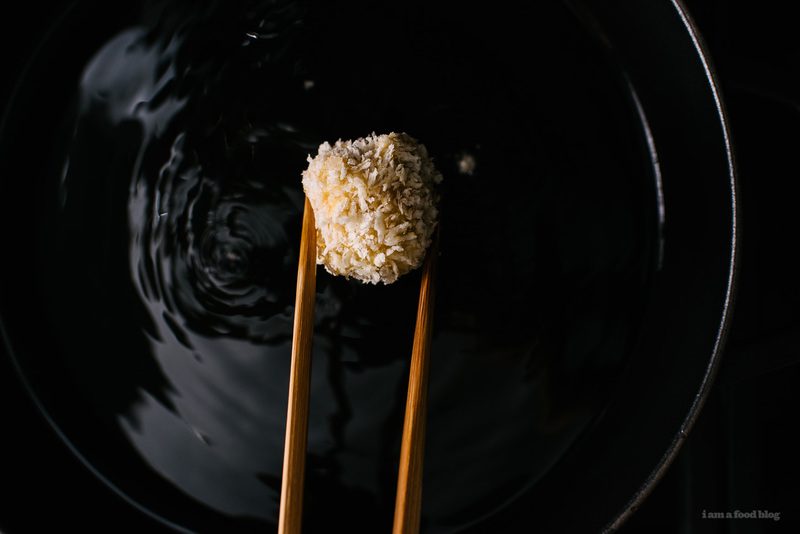 Roll in panko to coat. In a deep sided, heavy bottomed pot, heat up 1-2 inches of oil over medium heat until it reaches 375°F. 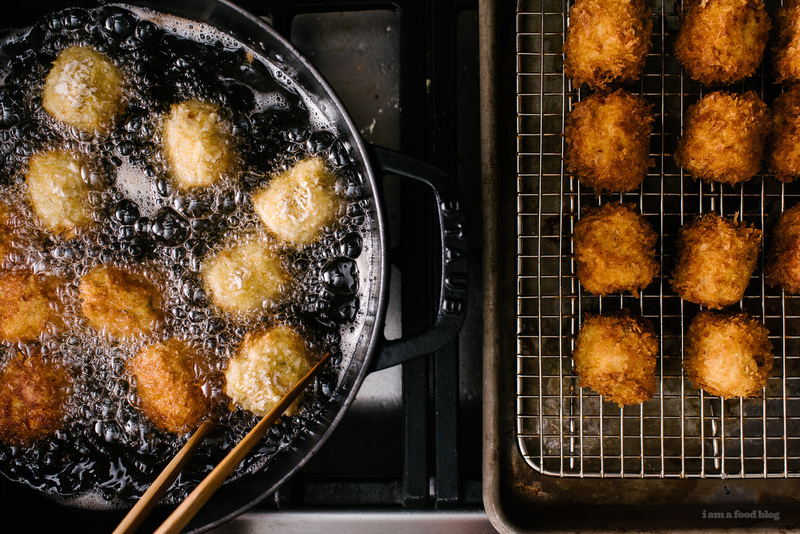 Gently place the croquettes in the hot oil, being careful not to overcrowd, turning occasionally and maintaining oil temperature of 350°F, until the breading is golden brown and crisp, 5–6 minutes. Use a slotted spoon to transfer to paper towels to drain. Let cool slightly and enjoy hot with cranberry or tonkatsu sauce! 5 Comments • Add yours! This post is the epitome of why I love this blog. Take a thing I’m not a huge fan of :: leftovers :: and create it into something exciting – Thanksgiving korokke! Thanks for the inspiration! Just made some with a buttermilk batter. Yum. 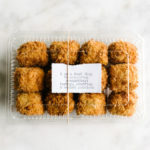 ooh rendang croquettes sound bomb! Copyright © 2016 i am a food blog. All rights reserved.